Roland Tribes-Roland Canada TRIBES is a collection of online communities where Canadian Roland & BOSS fans gather to talk about the music they’re making (and listening to!) and get expert advice on the gear they own or are thinking of buying. TRIBES include SYNTHS & DJ, V-DRUMS, PIANO, RECORDING, PRO A/V, and more. Each TRIBE is moderated by Roland Product Specialists who are ready to jump in and provide additional help (and opinion!) as needed. Roland Specialists will also regularly share video tips and tricks and other helpful resources within each TRIBE, all meant to inspire your creativity. Interesting or helpful TRIBE posts can be shared through popular social media services; it’s easy to expand the conversation to your online friends! Below- The completed design of my 2019 Drums/Percussion Concert Kit. 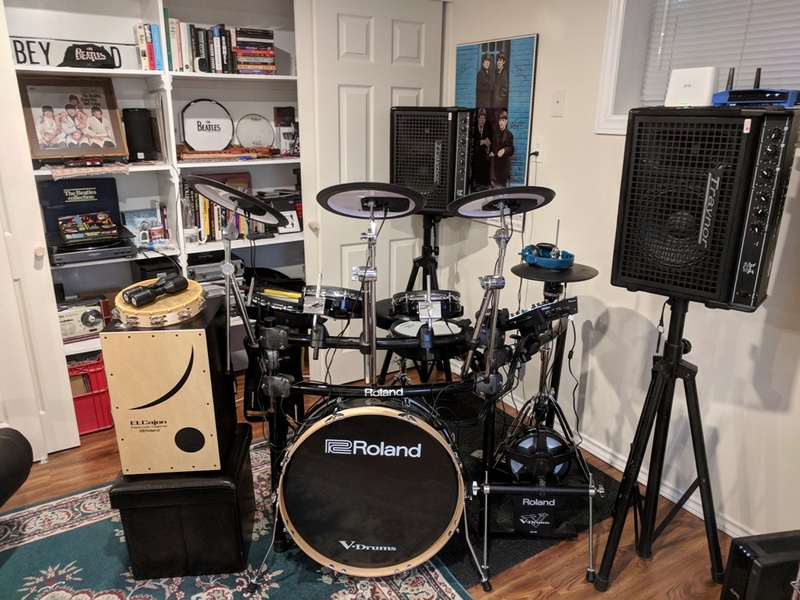 Roland TD-25, a 22-inch Skinny Sidekick Bass Drum with a Roland KD-A22 Conversion Kit, DW Double Pedals, Roland EC-10 Electronic Layered Cajon, Percussion Instruments & 2-Traynor DW10 200watt eDrum Speaker System, plus my collection of Blues Harps. The TD-25 Drum Stand definitely does not work for fitting this Bass Drum & I used my TD-12 Drum Stand with some refitting of the frame & it works. The Roland Documentation recommends the MDS-50K Drum Stand & it would work much better, but I wasn't about to add another expense buying a new Drum Stand. This is a nice setup & the new look makes this a beautiful kit. It triggers very nice, so far no problems. Below- My recent purchase at Long & McQuade Music in Peterborough. The TD-25 Roland V-Drums and the DW-10 Traynor e-drum 200 watt amps. I traded in two of my Yorkville NX25P 200 watt Powered Speakers for 2 new Traynor DW10's. I connected them to my new Roland TD-25 V-Drums when I got back & WOW!!! How could I have lived without them? Talk about bottom end Bass Drum with no distortion. Frequency range clear top to bottom. Can't wait for the next gig. And the other great thing is that they are a lot lighter & take up half the space. If any drummer is looking for a percussion amp, this is the one. I set up the TD-25KV Kit recently. To be quite honest as much as the TD-25 is closer to it's two big brothers the TD-30 & TD-50, my older TD-12 Kit, (TD-20's little brother) still, has some great sounds and programming that I find that I like. Now that I've seen the pros and cons of both I am going to combine the best of both to build a very nice super-kit. Another nice thing about keeping both is that I am starting to teach again and I can use both for the students. So in conclusion, my older TD-12 isn't so old when it comes to technical advantages. For those who are new to drums and are thinking Roland looking for a new kit, the TD-25 Kit is perfect, but not so much the price, so you could look for more suitable cheaper solutions in other manufacturer's makes and models to come up with the perfect kit for your needs. Roland TD Sound Modules are superior in the market but the price is high for most. Too bad it's only for those few who can afford it. The Dawn of SuperNATURAL-Powered V-Drums... Play, Feel, Believe! For over a decade, Roland's revolutionary V-Drums have lead the industry in expressive sound quality and incredible playability. With the introduction of the SuperNATURAL-powered TD-50KV V-Pro Series, the electronic drum set reaches a new pinnacle in drumming performance. 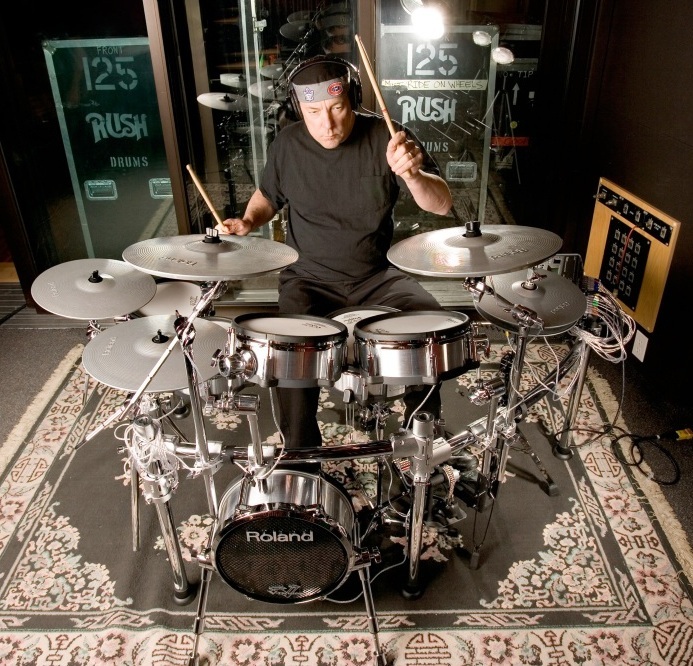 SuperNATURAL sounds with Behavior Modeling, along with advanced sensing technology, provides a new level of expressive sound quality and playability, resulting in an instrument that reacts and responds to all the subtleties, nuances, and dynamics of a drummers technique. In addition, USB audio-playback functionality has been added to expand the performance palette. For the stage or for professional recording, V-Pro is truly a complete and natural drumming experience. 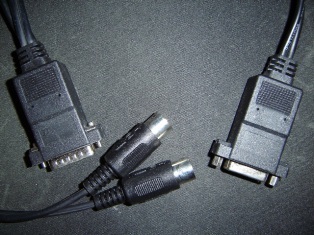 There are many MIDI connections out there and if you have a Midi Interface Card or not you can buy a cable with or without the Midi Interface Card. If you don't own these virtual drums and you're looking for, pardon the expression, "electronic drums" (which is the new wave in percussion), then you've got to check out the Roland V-Drums. I've been using the V-Drums starting with the TD-10 Module for over fifteen years now (newest is the TD-50 Module) and have had acoustic percussion for 40 years. I should know if I really wanted to leave my acoustic percussion behind. Well, I didn't go kicking and screaming. When I sat on this set at a local drum shop in Toronto I didn't go back to acoustic drums. The pros and cons were in the V-Drum's favor. There were many issues I had to overcome with Virtual Drums. First, are they going to sound electronic? I had clip on electronic synthesizers for my Premier kit back in 1979. They sounded electronic. They were cute little gadgets that clipped on to the rim and these rim sensors created sounds and the sound wasn't bad overall. I used them for many years successfully. Still like your acoustic kit? Don't worry, because you can keep the kit and convert it into V-Drums and still keep your initial investment in that beautiful acoustic look and feel. Are you using microphones with your acoustic kit? No more microphones too, because Roland has "Acoustic Triggers". 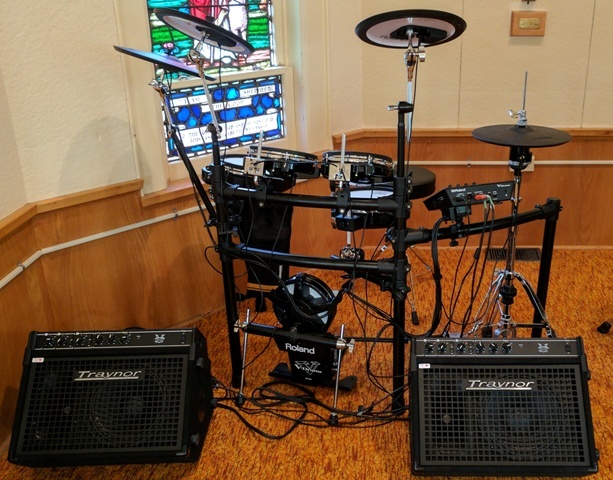 With MH-12/10/8 Mesh Replacement Heads and Acoustic Triggers along with a Roland TMC Trigger Midi Converters and maybe a couple of CY Cymbals, acoustic drums have been converted to V-Drums. And they don't make loud noises to disturb the neighbors, because now you can practice with Headphones. Hey, I live in an apartment and have had full band practices here through a mixer and headphones using my V-Drums. No one complained and it was like a recording session. Another thing. I kept my snare drum from my acoustic kit because it is a collector's item. My V-Drums are off site right now. 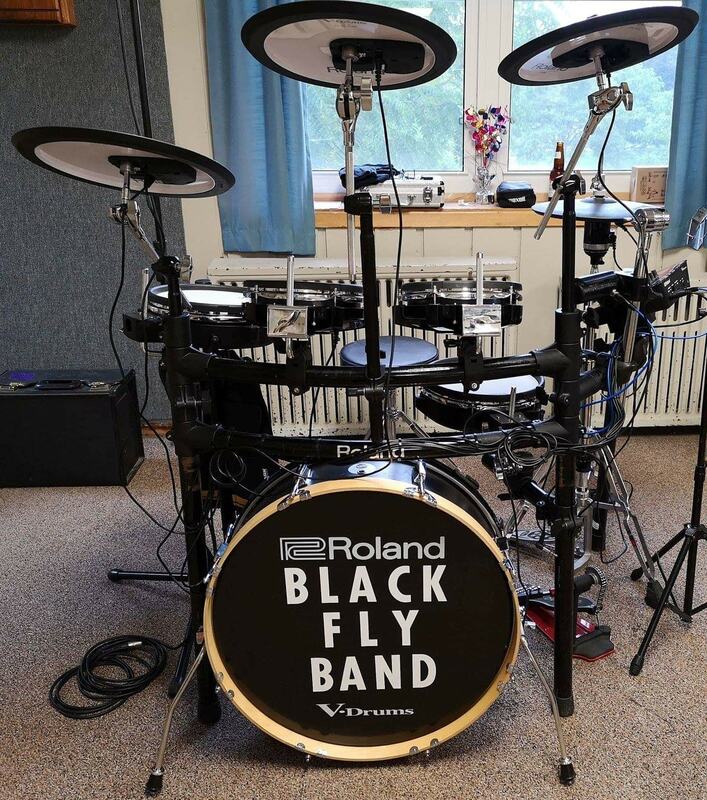 I just pulled my acoustic snare drum from the shelf and will add the Roland PCK-1 Practice Conversion Kit, that has an RT-5S, Snare Trigger, 14 inch Mesh Head, Rubber Rim Silencer, RM-2 Mounting Bracket and Connection Cable. Bingo! I can practice to my heart's content anywhere, anytime without annoying the neighbors and my family. And I can use it anywhere; The Cottage, Party's as additional Percussion at jam sessions and the list goes on. And one more thing, I can add it to my V-Drum Kit when I play live gigs for added percussion. What else do you want! There are many, many discussions of what equipment works best with the Roland V-Drums. All agree there is a need for a subwoofer to handle the bottom range of the V-Drums. The best to have would be a "Powered Subwoofer" or "Active Subwoofer" . My recent purchase at Long & McQuade Music in Peterborough. The TD-25 Roland V-Drums and the DW-10 Traynor e-drum 200 watt amps. I traded in two of my Yorkville NX25P 200 watt Powered Speakers for 2 new Traynor DW10's. I connected them to my new Roland TD-25 V-Drums when I got back & WOW!!! How could I have lived without them? Talk about bottom end Bass Drum with no distortion. Frequency range clear top to bottom. And the other great thing is that they are a lot lighter & take up half the space. If any drummer is looking for a percussion amp, this is the one. You could plug your Roland Sound Module into your home stereo or ghetto blaster, but you'll blow the bottom end of the speakers for sure, which just can't handle it cleanly or efficiently, unless you have some kind of home stereo system that is at 1,000+ watts with heavy duty speakers. Roland provides amplification which are all specifically designed for these V-Drums. Look out and beware !!!! Don't go plugging any costly electronic equipment into "unknown" or "untested" hydro, especially when you don't know what you are plugging into. Every venue you take your kit to is leaking bad hydro somewhere. Go to your local hardware or electrical store and get one of those good quality outlet testers. The one that shows good/bad/faulty ground and especially, reversals. Yes, you can have a reversal with AC. There is a hot and a neutral and if the tester is of good quality, and don't but a cheap one, they aren't that expensive, it will red light your bad wiring. Or, why don't you use your TD-Module to test the electrical outlet? A small UPS, has battery backup and I plug the TD Sound Module into the Battery side. It is also a surge protector for your other equipment such as Powered Speakers, Mixer, etc. Understand Audio Cables. There is a big difference between speaker wire (usually unshielded stranded wire), guitar cable and plugs (unbalanced), XLR Audio balanced and TRS 1/4 inch balanced. Your Roland Sound Modules have unbalanced 1/4 inch outputs and you can get a ground hum into your amplifier. Get it all balanced or you are going to get hum that can be irritating. I use all balanced TRS and XLR everywhere. They are a little more expensive than the usual unbalanced 1/4 inch plugs and cords, but spend the extra dollars to eliminate the AC Hum. One of their main purposes is to convert unbalanced and/or high impedance instrument signals into a format suitable for direct connection to a mixing console's mic input . 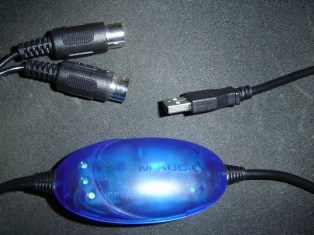 Quality microphones have a three-pin output jack which is referred to as an XLR connector. Most electric guitars of today have a two-conductor unbalanced 1/4" output jack. The XLR microphone input jack is low-impedance while the output signal from an electric guitar is high-impedance. If you connect the guitar directly using some kind of homemade connection, the mixer-input would put a load on the guitar-output that would effect the tone quality for the worse. A direct box is used to convert the output of an electric guitar, bass, or keyboard into a signal that can be plugged into a balanced low-impedance microphone input. A transformer inside the passive direct box is used to correctly change the impedance and provide the balanced output. The Yorkville passive direct boxes are designed so that the transformer correctly matches your instrument output to the mixing console input which allows your tone to have the brilliance that you desire.